Thus, it will be another fun-filled summer for Dean Lombardi and crew; as they once again will lean heavily upon team VP Jeff Solomon, the resident capologist, to help solve a complex salary cap riddle before the puck drops on the 2016-17 season. 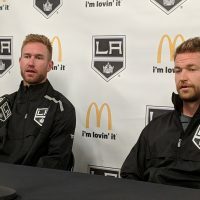 In December we wrote about why one of the team’s four key contracts is likely to be traded this summer – that of Dustin Brown, Marian Gaborik, Jake Muzzin, or Alec Martinez. In reality, it’s not that the organization is overly thrilled with losing any of those players; it’s simply the reality of the salary cap era. Debate which of those you’d rather lose all day long – and there are clearly vociferous supporters and detractors of at least three of them – the fact remains Lombardi’s calculator and spreadsheets have to be pulling at his heart strings. Considering the team has rather gaping holes on defense, we’ll assume Muzzin and Martinez are not likely to leave town. They both have affordable contracts and come with an attractive mix of youth and experience that the Kings should still covet for several more seasons. What that means for Brown and Gaborik will be fodder for much discussion between now and mid-July. Clearly, that potentially leaves a pile of work to be done this summer. However, several of those spots could (and should) be filled by players within the organization. And even if the coach or others in management may not want to go in that direction; they may have no other choice due to the cap. Before you start to build your personal arguments regarding who should be moved, allow us to quickly arm you with some numbers. As we always say when reviewing salary cap information, please ignore the line combinations and defensive pairings, they are only for illustrative purposes. The more important thing to focus on is the way dollars are spread across a 23-man roster. Add in the $1.57M penalty for the termination of Mike Richards’ contract and the Kings would be pushing the upper limit of the proposed cap. 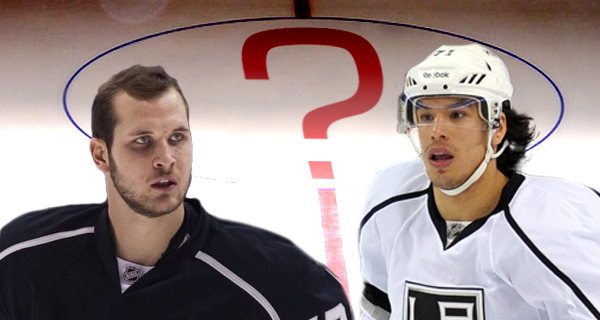 – If Brown is moved, it would most likely cost the Kings a package of players – i.e. 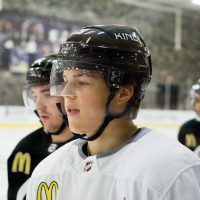 Pearson (who could be replaced in the lineup by Mersch) or a prospect like Adrian Kempe or Derek Forbort – to balance out the deal. This would only further necessitate the Kings willingness to balance out their pricey top lines with some less expensive players in the bottom six and/or among the lower pairings on defense. – Lucic is coming off a contract where his average cap hit was $6M. He says he wants to stay, thus it’s fair to assume he and his agent understand that likely means a pay cut, considering L.A.’s cap crunch. Trading another contract could open up more money for Lucic (but really should instead be used on a defenseman). That said, if the Kings were to retain any salary in such a trade (for Brown or Gaborik), they would almost have to be assured of adding a young defenseman under a long-term contract (either in the trade or in a separate deal – like one involving Jacob Trouba of the Winnipeg Jets). – In addition to the Lucic signing and a $3.5M addition on D, the above example also assumes UFAs Trevor Lewis, Jamie McBain, Kris Versteeg, and Luke Schenn do not return. Other assumptions include RFA Brayden McNabb not being part of the opening night roster (although he could be, depending on a few of the other players staying/leaving), and RFA Dowd re-signing at a modest rate (moving from $600K this season to $850K next season). – None of the above is meant to suggest “this is the Kings 2016-17 opening night roster,” it is merely a guide for their cap situation leading into what should be an interesting summer. Trouba is not a good pick up. I read that he already thinks he should be getting $6 mil a year. He hasn’t proved he is worth that much. If you think Lucic signs for 5 million a year you’re dreaming. Why would he take a 1.5 million dollar pay-cut to stay in L.A.? The fact that King makes more than Pearson is absurd. So is Greene’s contract. 4 years?! What the hell was DL thinking? Personally I would like to see Dustin Brown traded. His contribution over the years has fallen to a point where he cost more than he’s worth. 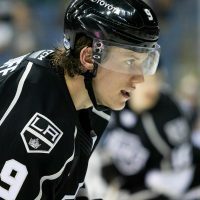 Getting rid of him would free up over 5 million Plus it wouldn’t hurt for the Kings to have a new captain! Simone who can actually play with skill and passion and doesn’t fall down every time he’s hit by the opposing player. I cant count every time Dustin Brown falls to the ice and his skill of scoring goals is long gone. John I’ve always wondered this, have you heard from the Kings why they are so intent on carrying a 23 man roster? Each game is only played with 20 players, so if you have three extra one-way contracts in the press box each night ranging from 600k to 1 mil each, that’s 2-3 mil in cap space you’re just wasting on extra players. I know you want extra players for when you have injuries, but isn’t that what AHL call-ups are for? And those don’t waste the extra cap space. For example using this year’s roster, say Marian Gaborik gets injured, then you call up Michael Mersch. Is that really any worse than putting Jordan Nolan is? It’s not like the best Manchester call-ups are that much different from the 3 worst players on the 23 man NHL roster. If they’re the 3 extra, then they’re not that good anyway or they’d be regulars. And this way, you save the cap space. I imagine maybe the Kings like having the injury replacements already there with the team, but remember you can’t sub them into a game anyway. If someone gets injured mid-game, you can’t put the guys from the press box onto the ice anyway. You have to wait until the next game to put the replacements in, which gives you plenty of times, between 24 hours and 72 hours depending when the next game is, to call up the injury replacement. 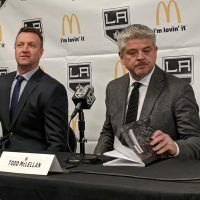 This could easily save the Kings at least 2 mil in cap space next year, and open up more opportunities for young players to get some games with the big club, which has also been an issue in recent years. Why not just do this? It solves two problems at once with very little downside. The only downside I can think of is if you get like 10 injuries at once, and don’t have enough AHL call-ups. But that could happen even if you carried 23 one-way contracts, because that only covers 3 injuries, not 10. Plus there are always replacement-level players available anyway. If you get 10 injuries at once, then you can go out and sign your Kevin Porter’s and those types who are always available midseason, just like Jamie McBain was a couple seasons ago. That way you still save the cap space earlier in the season, and only waste it on extra one-way contracts by necessity if injuries dictate you have to. Otherwise you save the cap space. So there’s really zero downside and a whole lot of upside to only carrying a 20-man roster instead of 23. Have you ever asked your Kings sources why they want to carry 23 when they’re in the middle of a cap crunch? It seems like they’re carrying the extra 3 guys now at the expense of filling needs in the top 20 guys who actually play when the team is healthy. Waivers would be involved in some cases. So you’d risk losing players when you send them back down. Not good. The 20 man squad would not allow for “maintenance” days or letting injuries take a little extra time to fully heal. You’d be rushing your quality back to the ice too fast. Not good. The call ups would not be practicing with the NHL squad in advance of actually getting called up. Ameliorated to some extent since Ontario (and Manchester) are coached with the same schemes to enable easier call ups. But, there’s no building of on-ice chemistry that way. Not good. If a player goes down during a home stand, it’s easy to get a call up from Ontario here. But on a road trip it gets much more complicated. There’s too much of a risk of having only 18 or 19 men on the bench when injuries happen on pretty much anything other than an intradivisional road trip. Not good. You’re willing to risk too many points in the standings to save $2-3 million dollars. It just can’t be done. Especially when the Central will remain strong and likely continue taking bother Western wild card slots. Brown — to Buffalo (gotta imagine he’d love being near home, Ithaca is only 90 minutes or so away, to finish his career), for picks and maybe a prospect. Go ahead and trade Nolan (meh) and Clifford (I really would love to keep him) for prospects or picks. Use that money to sign Lewis. He’s far more versatile and important than either of the other too. Realistically, the window has closed for now. Better to work towards having pieces to re-open it in 2-3 years. Call it a reset if you must. But getting the depth of the organization on-ice experience now could pay off soon enough to justify doing so. 2016-17 will be tepid at best. Let’s make sure ’17 through ’19 are not. Pray for the Loonie, it may be our only hope…. No waivers wouldn’t be involved. I’m talking about players on two-way contracts. There are a ton of them in the NHL. Of course there would be maintenance days. Are you trying to say an NHL team can’t practice with less than 20 players? I don’t get it. Even by that logic, no more than three players can get injured or have maintenance days at once. I highly doubt that’s the case. You just practice with as many rested players as you have. If need be assistant coaches can step in on drills, but I don’t know any drill that requires 20 players. So if those are the reasons, they just sound like more reasons that haven’t been given much thought, like this is the way it’s always been done so we never stopped to think if it was actually necessary to waste 2-3 mil cap space, a ton of cap space, to avoid the two days a season where we have to practice with 14 guys instead of 17 guys because six players needed rest days. I mean come on that’s not a reason at all. And waivers doesn’t apply to two-way contracts so that’s also not a qualifying reason. I still see no reason the Kings can’t save a bunch of cap space here other than unexamined tradition and lack of thought. I know Scuderi’s not the player he was a few years back, but he played very well from the moment he rejoined the Kings. Look at his +/-, and then realize he wasn’t paired with Doughty until the playoffs began. He’s been solid. What does Greene add, exactly? He’s big and he’s slow. I guess it’s interesting seeing him open the same cut on the bridge of his nose every single game, but beyond that, are all the penalties he takes really worth all that money? Lombardi’s real problem is that he rewarded too many mediocre players with ridiculous contracts. Richards never should have been re-signed. Brown should never have gotten that long a deal. Those two mistake are likely going to cost us Pearson and/or Gaborik, and I’m sorry but Mersch is nowhere near where Pearson was at this point in his career. Good read. D needs to be fixed. Need a quality replacement for Voynov or they wont win. Blues beat Hawks based on the depth and quality of their D. Pareyko! Schenn, McBain play Voynovs mins and you lose. Simple. Agreed. But I hope the obvious need to fix the D doesn’t make Dean forget that there is also a less obvious need. This team still struggles to create scoring chances against good teams like the Sharks, especially ones that aren’t dependent on dmen shooting from the blueline and us hoping for a rebound. Which by the way, is another reason losing Voynov was so big. For a team that can only seem to create time and space in the offensive zone for their defensemen with the puck at the point, never the forwards in the slot, that makes your dmen’s ability to shoot and handle puck way more important. So when you have Schenn and Scuderi as your offensive catalysts many shifts instead of a skilled guy like Voynov, it really hurts the offense. But they need a better third line center, never replaced Stoll, and some actual top six wingers. With Gaborik declining, Lucic more of a power forward, Pearson not the same since the injury, they may not have a single top six skilled scorer or playmaker besides Toffoli. They have one legit top six offensive winger right now, Toffoli. Need more than that… two more ideally. So two top six forwards, a third line center, and a top 4 dman will get the Kings their 3rd Cup. One top six forward, a third line center, and a top 4 dman makes it a toss-up. Just a top 4 dman still puts the Kings on the outside looking in, especially considering Chicago is 10:1 odds to add a top 4 dman in the summer too. As it Stands right now, Andreoff is > Shore. Shore has to be the extra or sent back to ONT next season. He was horrible this year and AA showed growth.. Just my opinion.